You can check patch numbers for all release's for your addons. Required for 5man Heroic Dungeons! Must have for Healers and Hybrids! Keep track of all your Mining / Herb nodes. Needed For Raids and 5man Dungeons! Hunter aspect and trap bar for you hunters who want a easier time. 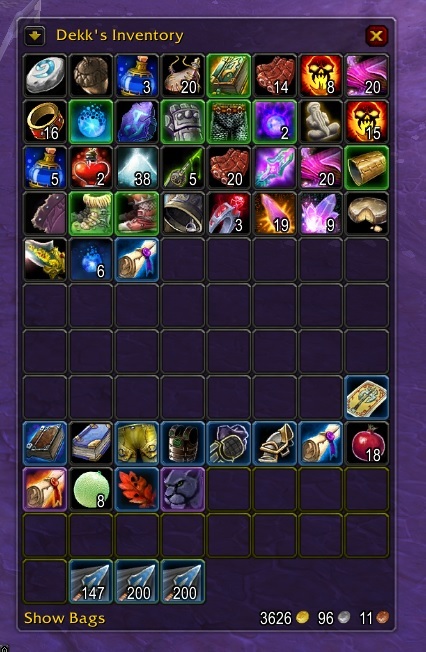 For checking all loot Being PvP / PvE 5mans / Raid loot from boss's. For people to lazy to read quests. Feel free to add more below guys! Merges all of your bags in to a single big bag. Great interface addon, A bit hard to set up at first. Dominos is an action bar addon, easy to use and very easy to set up key binds. Outfitter is an equipment management addon which gives you fast access to multiple outfits to optimize your abilities in PvE and PvP, automated equip and unequip. Very useful for changing specs. Talented is a replacement to the default Talent UI, with a lot of added features. Also great for changing specs as you can save spec templates. - for checking if you have all them quests (ability to query server db came on wotlk, so if you want to use this, use it from the start of leveling, it basically catches your quest completes and projets them onto a list of quests in the zone). - for checking if you have all them recipes.